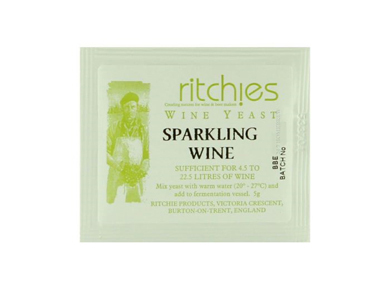 We sell Ritchies products like Sparkling Yeast - 5g sachet online in the UK and directly from our award-winning store in Scotland. This Sparkling yeast is sufficient for up to 23 litres (5 gallon) of homemade sparkling drinks, like elderflower champagne. This strain of wine yeast was chosen from over 150 available worldwide. It produces exceptionally clean and fresh sparkling wines, like elderflower champagne. Sparkling (wine) yeast for making your own elderflower champagne at home! You could drink this within just a few weeks, which shouldn’t be too hard, it’s only very light alcohol and very refreshing on a warm day (if we get any). This recipe contains Sparkling Yeast. Where can you buy real Sparkling Yeast 5g safely online? If you are wondering where you can buy Sparkling Yeast - 5g sachet safely online in the UK, then shop with us. Sparkling Yeast 5g - Sparkling Yeast - 5g sachet in Homebrew Chemicals and Homebrew.